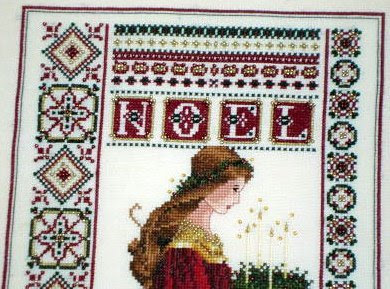 My Christmas Cross Stitches - or - Stitch More! This was a Christmas project that I did many years ago that I actually kept. I found the design in a cross stitch magazine and I did it with waste canvas. 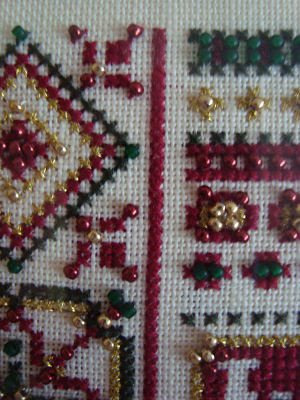 The berries on the bear's wreath are Mill Hill beads, nicer than the french knots called for. I stitched it onto a fairly lightweight sweatshirt, as it usually doesn't get very chilly in my neck of the woods in December. I still manage to wear it proudly a couple of times each holiday season. This is my new take-along project, Mr. & Mrs. Flake. It's a plastic canvas ornament that I'll probably attach to one of my Mom's gifts. I had mentioned in a previous post that her Christmas decorating theme is snowmen and snowflakes. I think I'm going to change the colors in Mrs. Flake's scarf from the pink and purple, to blues, which is also part of her theme. Only eight months until Christmas! Keep stitching! Please excuse my photos, they were hard to take without getting some glare from the glass. I believe I stitched this on 32 count cream linen, changing the recommended model color that seems to be my style. 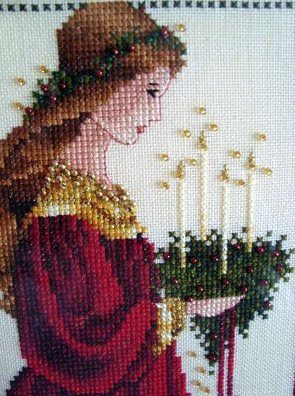 The only problem with the fabric is you tend to loose the candles into the fabric the further away you are from it. I really enjoyed stitching the reds of her dress. 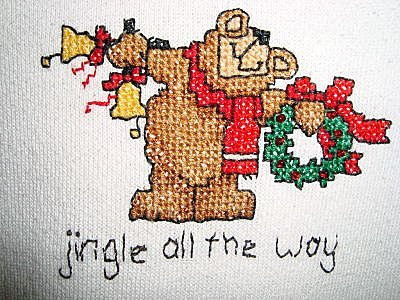 This is one of the few Christmas cross stitch pieces I've kept. 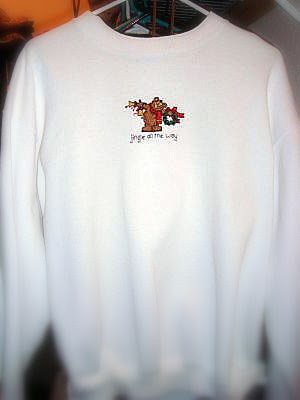 I remember stitching on this during Spring Break 1995. I also remember frogging the bottom left corner of her skirt THREE times because I kept miscounting! 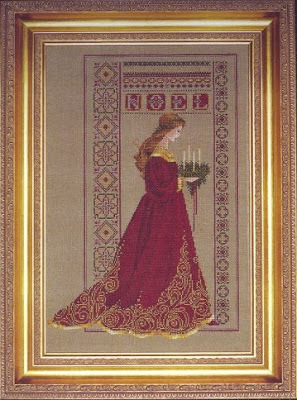 The gold specialty thread was a little tough to work with and there is a lot of bead work, but that is what makes it such a beautiful and amazing piece. The double matting helped once again in keeping the glass from smashing the beads. Here it is! 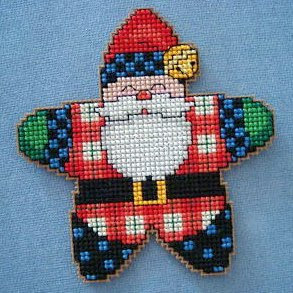 Star Santa Whimsy was my take-along cross stitch project. I kept it in my purse in a ziploc bag and stitched it when I was kept waiting. 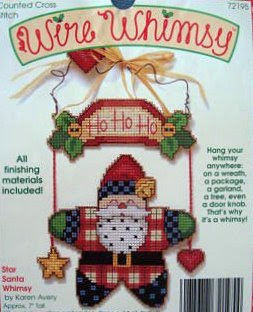 My next take-along project is also Christmas themed. This is how it's supposed to look when finished. I haven't quite gotten that far with it yet. But I do have all the pieces stitched, and I'll assemble this when I have a few more projects to finish. March is almost over, and we draw a wee bit closer to Christmas. Keep working on your projects! 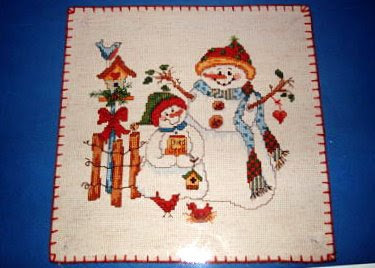 This is a picture of the picture of the project by Candamar Designs called "Frosty Friends". It is a cross stitch panel that buttons on the front of a pillow. 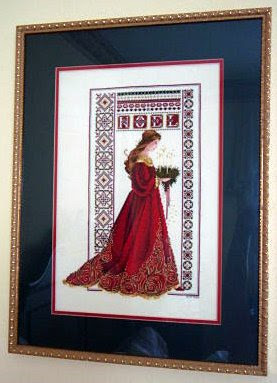 It is actually my mom's project, but she gave it to me to take over the cross stitch portion. This was her start above. Naughty mom left her hoop on! As you can see, she had changed the background to a pale blue. The pillow she will button this on is a dark blue print. Her Christmas "theme" is blue, white and silver, snowmen and snowflakes. 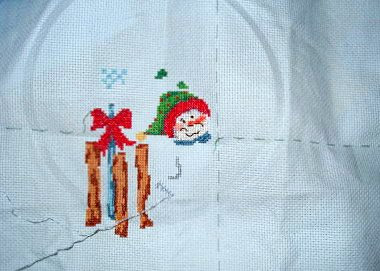 Since she changed the background from the white, the snowmen will need to be sewn in. She changed those stitches to shiny Anchor floss as you can see in my stitches below, right hand side. Since she handed it over to me, I decided to restart and change the fabric from aida to evenweave (I'm on a bit of an evenweave kick lately, since joining the Our Friends HAED SAL). The color is more of a blue grey which I think will 'pop' the snowmen out more. The pattern is a little hard to read because where it was folded, the symbols are worn. Honestly, I don't know how much stitching I'm going to do on this design right now. I'm in a spring mood and my mom's not in a rush. 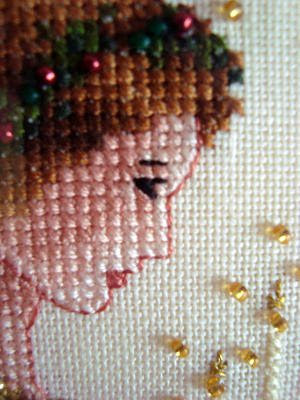 When I do complete the cross stitch, it's up to my mom to trim the design and add the buttonholes and blanket stitch. 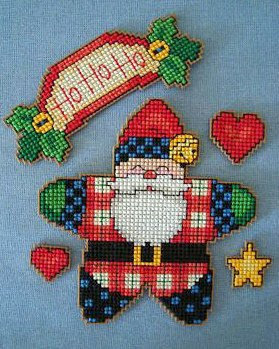 I actually do have one Christmas project stitched. I will post it once I assemble it. 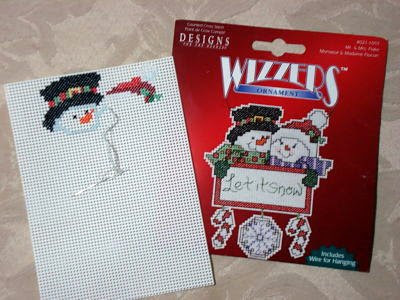 I also need to pull threads and start stitching the lighthouses, and my new take-along project is another Christmas themed plastic canvas whimsy. First project posting to Stitch-mas! 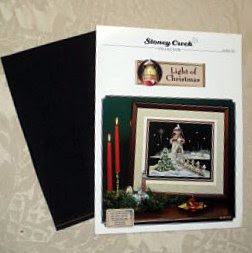 I am hoping to soon start work on "Light of Christmas" by Stoney Creek Designs. It will be a Christmas for my BFF Angela. 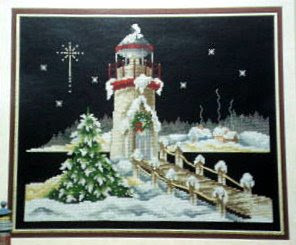 She LOVES both lighthouses and Christmas so this will be perfect for her. I am hoping to make it into a pillow . . . I have the black linen to stitch it on as you can see in the photo. I have NEVER worked on black cloth before! I remember reading a tip about putting a white towel on your lap to make it easier to see the holes. I'm going to try it. 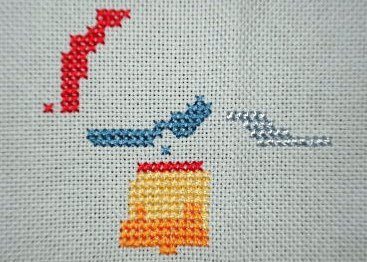 If anyone out there in cyberspace have any suggestions to make stitching on black easier, let me know! Get the FREE Christmas Song of The Day widget and many other great free widgets at Widgetbox! Get the Yule Log widget and many other great free widgets at Widgetbox! Get the Christmas Scrapbooking widget and many other great free widgets at Widgetbox! Get the Life is a Stitch widget and many other great free widgets at Widgetbox!